We moved off the grid a year ago where I have continued to make my fave granola recipe but yesterday, for some reason, I decided to try something different. Oh, right. We are in the shoulder season out here in the bush, with limited sunshine these days so no rays to power our batts…that’s what prompted me to open an actual cookbook to source a Granola Recipe. When the Batts are running low we conserve energy in every way possible which means no turning on my computer. I usually just open up my old fave Fruit and Nut Granola . I can cook to my hearts content because that is propane fuelled…well, let’s not go crazy there…still have to have the propane in the 100lb tanks to operate the stove and heat the water. Yes, I could have looked in my treasure trove of hand written recipes but I have this Skinnytaste Cookbook that I paid good money for so I thought I might as well flip through the pages. On Page 26 you will find the recipe for her Good For You Granola. 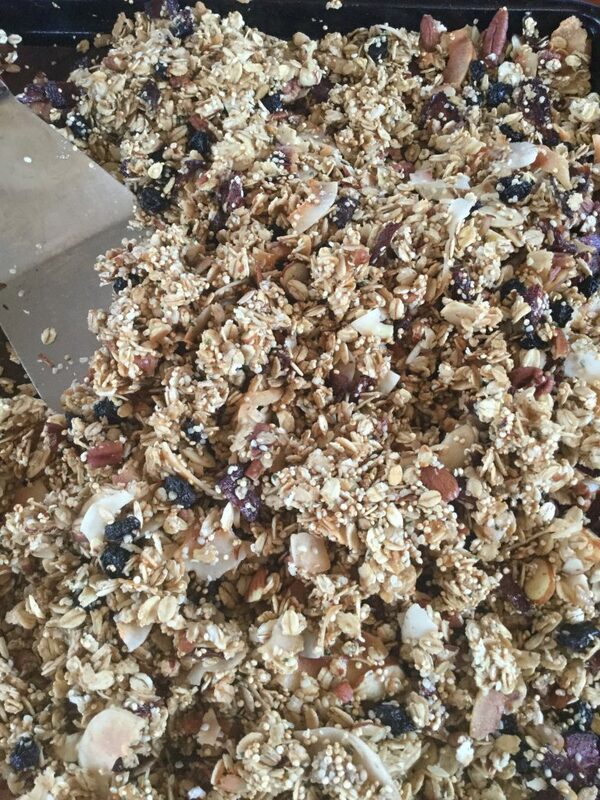 I’m calling it As You Like it Granola because you can really make all kinds of substitutions…which I did…and it will still turn out wonderfully! The thing that drew me to making this recipe is the drastic cut in fat and sugar! I didn’t think it could possibly taste as good as my old recipe but I was wrong. It is AMAZING! I searched for her recipe online but couldn’t find it so I will write it up here for you but I strongly suggest you head over to SkinnyTaste to check out all of her fantastic recipes! To be sure, I double the recipe and I am very glad that I did! Because I doubled the recipe and found it to be the perfect amount for the two of us (regular Granola consumers) I am going to list the doubled amounts. And I am going to list my subs…coconut flakes, hemp hearts, pecans and as for the fruit? Your call! Line a baking sheet with parchment paper – preferable to silpat because you can chuck it away. Rinse quinoa thoroughly under cold water in a fine mesh sieve; drain well and pat dry with paper towels. Spread quinoa, oats, and coconut out on the baking sheet. Toast in the oven, stirring once, until golden, about 10 minutes. Meanwhile gather together the fruit and nut combo that you prefer, toss together with the cinnamon, nutmeg and salt; set aside. In another small bowl combine the honey, melted coconut oil, and vanilla; set aside. Remove quinoa/oat mixture from the oven. Pour the fruit/nut and spice mixture over top and gently mix in. Drizzle wet ingredients over all and gently toss with a large metal spatula, spreading the mixture evenly over the entire baking sheet. Return to oven and bake until golden brown, about 10 – 12 minutes, stirring once at the halfway mark. Remove from oven , give it a gentle stir, and cool completely on the baking sheet before transferring to a container with an airtight lid. Store in airtight container for up to a month….if it lasts that long! Fresh out of the oven Honey Whole Grain Bread! There is nothing better the smell of homemade bread permeating you home except maybe that first slice off that fresh outta the oven bread! Now I know there are some that say that you ought to let your bread sit for 24 hours before slicing into it but seriously? Who can wait that long? And besides, butter doesn’t melt into day old bread! It just doesn’t. And toasting slices of day old bread so the butter DOES melt doesn’t even begin to compare with butter melting into that steaming slice you have just cut from the fresh out of the oven loaf of bread. Okay, I maybe wait 10 minutes because let’s face it, that loaf of bread is HOT when it first comes out of the oven. And having worked in a few bakeries where we made bread? I’ve burned my fingers, wrists, forearms on hot bread and hot bread pans more times than I can remember! For this Honey Whole Grain Bread I have made adaptations to a recipe I found in my pilfered copy of Betty Crocker’s New Cookbook. Let’s see if I can find the recipe online? Fourth recipe and lo and behold! Woot! So you can go on over to Betty Crocker’s page and follow that recipe for Old-Fashioned Honey-Whole Wheat Bread to the T if you like. I don’t think I have ever made it exactly as specified. For one, I often halve the recipe to so I only make one loaf; if I had a freezer I might make the whole recipe so I don’t have to make bread so often. Wait! What did I just say? Making fresh bread is pretty simple so I actually prefer to make it often so I have fresh, fresh, fresh bread. That’s me though. Oh, and sometimes I make the whole recipe and use half to make bread rolls to go with a soup or stew that I might have simmering on the stove. Now you go ahead and use an electric stand mixer if you like. Since moving off the grid I find I actually prefer to make bread by hand. The weather can be so fickle so half the time I can’t even use the mixer anyway – no sun or wind equal power conservation! Anyway, I find the kneading process pretty relaxing; 10 minutes of kneading, or 2 1/2 songs, as it turns out, and you have yourself 10 very rewarding minutes! But right this minute? I have to go and shape the dough I have proofing in the oven. In the oven, you say? So in my current kitchen I have a propane stove that has a pilot light; that pilot light gives off just enough heat to make it the perfect place to both bloom my yeast and then proof the dough! Alright, dough shaped, proofed and baked. The bread rolls were great! The loaf of bread has cooled and is resting comfortably in a Tupperware container. Alas, now it is too dark for me to read the recipe in the cookbook! I will have to come back to this tomorrow. Pour warm water into a medium to large size mixing bowl; add a pinch of sugar then sprinkle the active dry yeast over top. Set bowl aside in a warm place to bloom the yeast; it takes about 10 minutes. While yeast is blooming measure out the honey, butter, salt and white flour. In a small bowl combine the old fashion oats, chia seeds and hemp hearts; set aside. Once the yeast has bloomed, stir in 1 cup of white flour and stir vigorously; add butter and honey, continue stirring just until incorporated. Add final cup of white flour, in a mound in centre of mixture; make a lil well in the centre of the mound and add salt. Stir white flour and salt into mixture; stir vigorously for 2 minutes. Add the oat, chia seeds and hemp hearts; continue stirring. Add whole wheat flour, a cup at a time until you have a soft dough. Turn dough out onto floured surface and knead for 8-10 minutes, until smooth and elastic; form into a ball. Place ball of dough in a lightly oiled bowl, loosely cover with plastic wrap and a clean kitchen towel and let rise in a warm place for 40 – 60 minutes or until double in size. Dough is ready if indentation remains when touched. Grease bottoms and sides of 2 loaf pans, 9x5x3 inches; set aside. Punch down dough, turn out onto lightly flour surface, knead a couple of times just to create a rough ball; divide in half. Flatten each half with hands or rolling pin into rectangle, 18×9 inches; try not to add too much flour to your work surface. roll dough up tightly, beginning at 9-inch side, to form a loaf. Press with thumbs to seal after each turn. Pinch edge of dough into roll to seal. Press each end with side of hand to seal. Place seam side down in prepared pan. Cover and let rise in warm place for 25-50 minutes or until double. Move oven rack to low position so that the tops of pans will be in the centre of the oven. Heat oven to 375F. Bake bread 40 – 45 minutes or until loaves are deep golden brown and sound hollow when tapped. Remove from pans to wire rack. Brush loaves with a bit of butter, if desired. Cool completely before storing in airtight container; will keep for 2 – 3 days, at room temperature. I have decided that it is very dangerous for me to follow Chocolate, Chocolate and More on Facebook for the simple reason that they are forever posting such great recipes! I want to try them all! The problem is, I need to a bigger audience to feed said baked products to! My husband can only eat so much of my baking and I just have a taste and am done with it…otherwise I would be the size of a house!!! I picked up their recipe for Hot Chocolate Muffins; they have been well received by everyone who has tried them! The only changes I have made are: Add White Chocolate Chips to the Cocoa Batter and add Semi Sweet Chocolate Chips to the White Batter. Go ahead, get in the kitchen and make these delicious muffins! In large mixing bowl, whisk together flour, baking powder, salt and sugar; set aside. In medium size mixing bowl whisk eggs, add milk, butter and vanilla and continue whisking. Create a well in your dry ingredients and add your liquid ingredients, all at once; gently stir to combine, just until all the dry ingredients have been incorporated. Divide batter in half. Add cocoa and white chocolate chips into one half of the batter and gently stir in; do not over mix. Stir the semi sweet chocolate chips into the white batter; do not over mix. 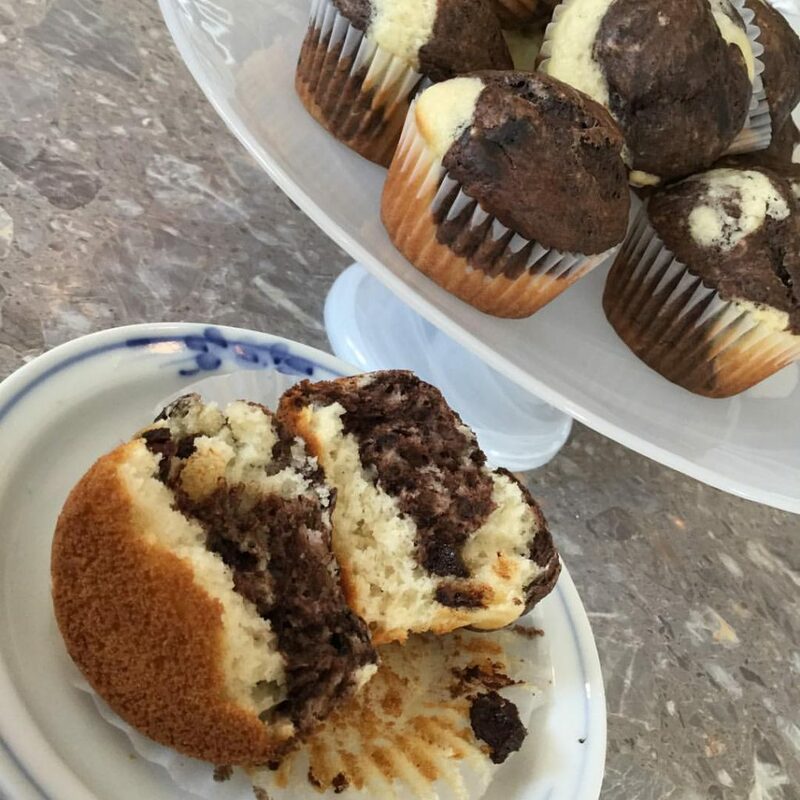 Place a teaspoon of plain batter into lined muffin tin; spoon a teaspoon of chocolate batter; add another teaspoon of white batter; finish up with a teaspoon of the chocolate batter. Bake in preheated oven for 15 to 20 minutes. Remove to oven and allow to cool in the tin on a wire cooling rack for 10 minutes. Turn out and cool completely on wire racks. I have to make Focaccia for my Professional Cook Level 2 Practical exam…well, I don’t HAVE to make Focaccia but it seems Dinner Rolls are frowned upon as …. That’s such a Grandma thing to make….well, hello? I AM a Grandma! I also have the choice of making a Baguette but the truth is, mine always tend to have gaping holes in them! Anyway, I decided to make this Focaccia instead of my tried and true Dinner Rolls. I have to admit, the second time I made this recipe, I was quite impressed! The first time, I made as recipe suggested and it came out thin and crispy – second time, I let the Focaccia proof for about 45 minutes before I baked it. The original recipe came from my ancient The Canadian Living Light and Healthy Cookbook, page 38. In large bowl, dissolve sugar in water; sprinkle with yeast and let stand for 10 minutes or until frothy. Using wooden spoon, stir in 3 cups (1 cup) of the flour, butter and salt; beat until smooth. Add enough of the remaining flour to form a soft dough. Turn out dough onto lightly floured surface; knead for about 10 minutes or until smooth and elastic. Place dough in greased bowl, turning to grease all over. Cover with plastic wrap or damp tea towel and let rise in warm place for about 75 minutes or until doubled in bulk. Punch down dough and divide into 2 portions ( No need to divide dough if only making one Focaccia).Form each portion into a ball. Place on lightly floured surface and sprinkle with flour. Cover an d let stand for 20 minutes. Stretch and pull out each portion of dough into 16 inch (40cm) long oval. Using side of hand, make ridges 1 inch (2.5cm) apart down length of each oval. Brush each loaf with olive oil, sprinkle with rosemary, thyme and salt. Cover loosely with tea towel and let proof in draft free for 45 minutes. Bake in 375F (190C) oven for 25 to 30 minutes or until golden brown. Remove from baking sheets and let cool on wire rack. Each Focaccia serves 4 – 6 depending on use.